There’s a new shoe cleaner to hit the market that has everyone talking about. Sneaker Venom Shoe Cleaner & Conditioner. It’s a natural solution that is safe to use on all materials and it’s biodegradable. Once you try Sneaker Venom shoe cleaner, you will agree that it removes dirt and stains effectively, while conditioning your shoes. Sneaker Venom is easy to use, and the results are amazing. Sneaker Venom is the cleaner of choice among the sneaker enthusiasts aka”sneaker heads” and those who perform sneaker restorations. Athletes also rely on sneaker venom to keep their shoes; sneakers, cleats, clean after a day of playing sports. If you want to learn more about the product, continue reading the information obtained from the sneaker venom website at www.SneakerVenom.com. “YOU LOVE YOUR SNEAKERS AND WANT TO KEEP THEM CLEAN, BUT THERE’S ALSO A PART OF YOU THAT NEEDS TO KNOW YOUR SHOE CLEANER WON’T DAMAGE YOUR SHOES OR THE PLANET YOU WALK ON. SNEAKER VENOM IS A NATURAL FOAMING SOLUTION THAT CLEANS AND CONDITIONS YOUR SNEAKERS. IT REMOVES DIRT AND STAINS WITHOUT THE HARSH CHEMICALS AND DETERGENTS THAT ARE FOUND IN OTHER SHOE CLEANING PRODUCTS. SNEAKER VENOM IS MADE FROM THE ORGANIC OILS OF COCONUTS AND JOJOBA PLANTS. THESE NATURAL OILS ARE TURNED INTO SOAP USING A NIFTY PROCESS CALLED SAPONIFICATION. WE MAKE SNEAKER VENOM HERE IN THE U.S.A. AND WE MADE SURE IT’S BIODEGRADABLE. ​BECAUSE SNEAKER VENOM IS NATURAL, YOU CAN USE IT TO CLEAN ALL OF YOUR SHOES. IT’S SAFE TO USE WITH DIFFERENT MATERIALS INCLUDING CLOTH, CANVAS, LEATHER, MESH, RUBBER, NYLON AND EVEN SUEDE! (WE DON’T RECOMMEND USING SNEAKER VENOM ON DYED SUEDE, BECAUSE THE DYE TENDS TO BLEED WITH WATER). 2. APPLY SNEAKER VENOM TO BRUSH AND SCRUB SHOES THOROUGHLY. 4. LET SHOES AIR DRY. For more information and to obtain a cleaning kit of your own, make sure you visit their website at www.SneakerVenom.com there you can shop for other shoe care products and apparel. 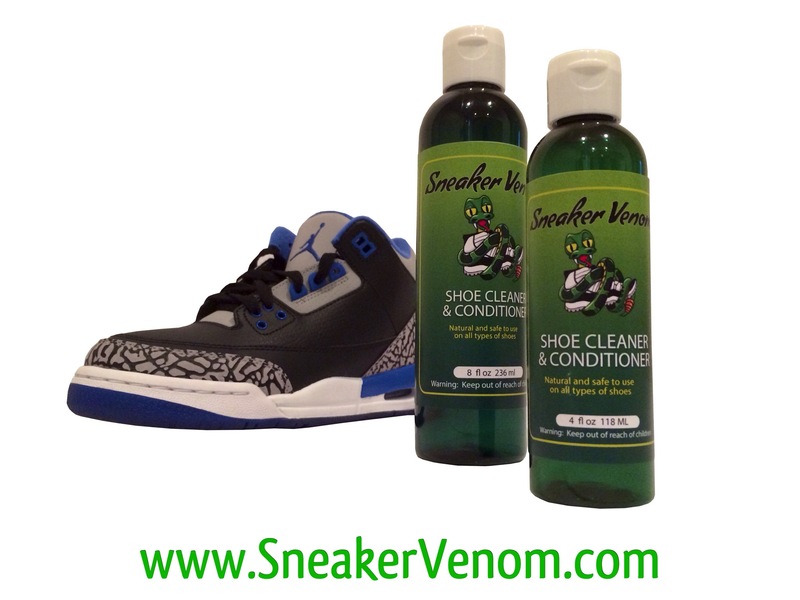 To learn more about Sneaker Venom shoe cleaner & conditioner, and other shoe care products, including how to properly use them, visit their frequently asked questions page.